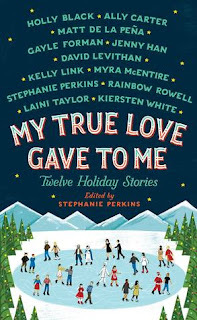 If you love holiday stories, holiday movies, made-for-TV-holiday specials, holiday episodes of your favorite sitcoms and, especially, if you love holiday anthologies, you’re going to fall in love with My True Love Gave To Me: Twelve Holiday Stories by twelve bestselling young adult writers, edited by international bestselling author Stephanie Perkins. Whether you enjoy celebrating Christmas or Hanukkah, Winter Solstice or New Year's there's something here for everyone. So curl up by the fireplace and get cozy. You have twelve reasons this season to stay indoors and fall in love. I was pleasantly surprised. I didn't like ALL of the stories, but I enjoyed most. And I decided that reading this right after National Novel Writing Month, was an AMAZING decision. Forget novels. I'm going to try my hand at short stories from now on. You get in. You get out. Stories off. Move on with your life. If you're in the mood for something festive and whimsical, pick up My True Love Gave to Me, a collection of short stories by some extremely gifted authors.